I love participating in blog carnivals that challenge me to try something new – a new ingredient, a new technique, a new approach. So, when I saw that this Month’s Go Ahead Honey It’s Gluten-Free theme was Scared Silly, I knew I had to participate. What exactly is Scared Silly, you ask? Well, Diane, this month’s host, explains it all over on her website, The W.H.O.L.E. Gang. But, the gist is that she challenged all of us to use an ingredient that scares us in some way. Now, had I not just posted a beet recipe, I would have been all over doing something with beets. But, I figured those chocolate cupcakes kind of took the scary out of beets for me (or at least knocked it down to apprehension instead of fear). Never fear (too much). I have a handy dandy combination of flavors that has never steered me wrong when trying to turn something scary into something scrumptious. What’s the secret? Garlic, ginger, sesame oil and lime. Seriously, that combo of flavors always has me at hello. The other major obstacle in brussel sprout consumption is being able to cook them without turning them into stinky mush. What better way to attack that than by shredding them and stir frying! I used the food processor to quickly shred both the sprouts and the carrots. But, theoretically, you could do it by hand, if you really needed to. Heat a dry sauté pan and add the sesame seeds. Toast for a few minutes until a few begin to pop and they become fragrant. Remove from pan and set aside. Add sesame oil and onions to hot pan. Sauté until onions are soft. Add ginger and garlic and cook for 30 more seconds, just until garlic is fragrant. Add shredded sprouts and carrots. Stir fry for a few minutes. Add tamari sauce. Continue to stir fry until sprouts are beginning to soften – a couple more minutes. You still want some crunch. Remove from heat and stir in lime juice. Serve topped with toasted sesame seeds. To make this a main dish, add a protein such as tempeh. Or, if you’re a nut freak like me, top with a generous serving of peanuts. This sprout slaw was actually consumed by that small child pictured above. His response? “Not the best Mom, but I can eat it.” From a 7-year old, I’ll take it. This post also submitted to this month’s Sweet or Savory Challenge hosted by Diet, Dessert and Dogs and Affairs of Living. For more healthy (or healthier) recipes, check out Slightly Indulgent Tuesday and the Hearth and Soul Blog Hop. 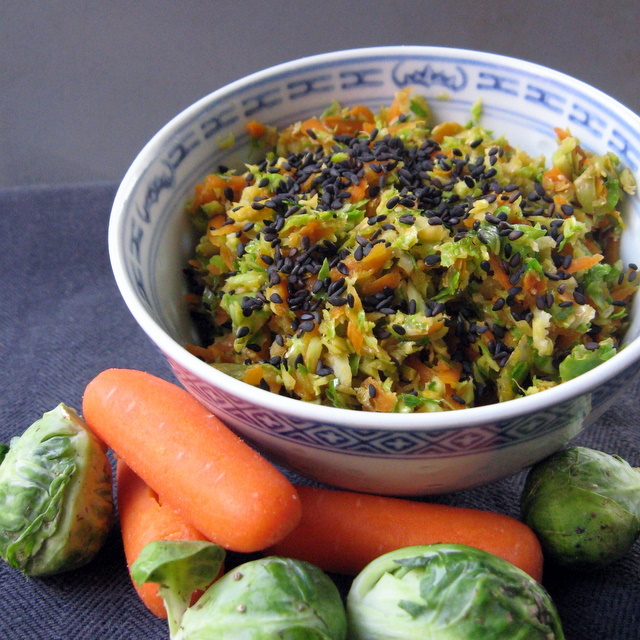 This entry was posted in carrots, Cooking Challenges, grain-free, main dish, sesame, side dish, vegan. Bookmark the permalink. Love what your little one said! The dressing sounds delicious, thanks for sharing. 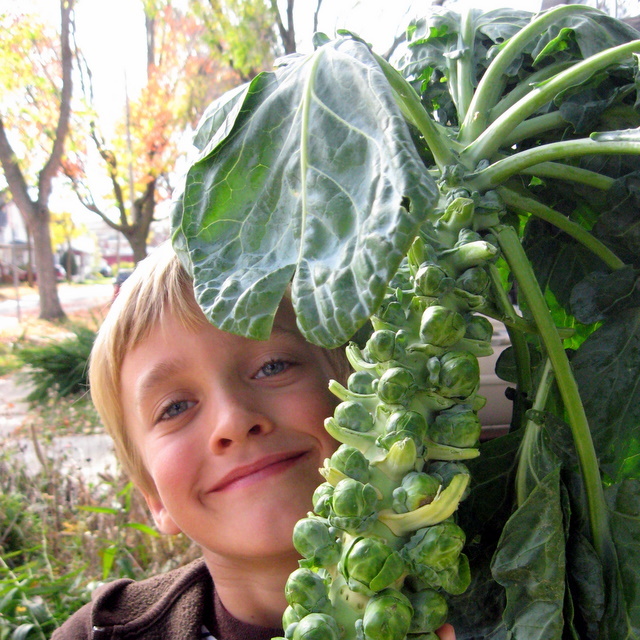 Brussels Sprouts are one of our fall favorites. Your recipe looks wonderful and I can’t wait to try it. Erika – I am going to convince myself to try them roasted. I’ve not done that yet. It is funny the things we are “scared of” and then come to find out they are not so scary after all! Shredding the brussel sprouts is a great way to serve them especially to kids and your all purposes seasonings – yummy! Thanks for sharing this with us at the hearth and soul hop! Thanks Christy. I appreciate it! Just hours ago I was thinking about making Sprout Slaw for Diane’s event. Well, I guess that one is taken, but boy does this look good! Great minds think alike, Alisa. You can still submit your version. I would guess it’s different than my version. Go for it! That almost makes me want to try brussel sprouts again! Though I may borrow your marinade idea for some other things. Fantastic!